I came across a program that claims it can provide people the chance to make $500 – $1,500 per day. It sounds cool, and it will really catch your attention especially if you’re looking for a way to create a decent income online. But with so many scams online, it’s essential to do your own research and know if this program is the real deal and if it can really deliver on its promise. Well, you come to the right place because, in this Second Income Center review, I will share with you all the info you need to know about this program. It will provide you with everything you need to know so you can make an informed decision about this program. In fact, there are some things you really NEED to know before joining! Second Income Center is a program that claims it can provide you the chance to make $500 – $1,500 per day. They also claim that you don’t need any technical skills or prior experience to succeed because they will provide you a blueprint that will guide you through the whole process. Their main business model is based on link posting, and it is the primary method they want you to use, which in my opinion, is NOT a good way of doing affiliate marketing. This method is considered spamming, and it could get your account banned, and you might be forced to create fake accounts to continue with your link posting activities. That is why I don’t recommend this program because it contains several red flags that, in my opinion, makes it a risky investment. I would suggest that you look for other legitimate opportunities that could truly give you the results that you’re looking for. What is Second Income Center and what does it offer? The first time you visit the Second Income Center website, you will notice that they are offering an exciting way to make money online. 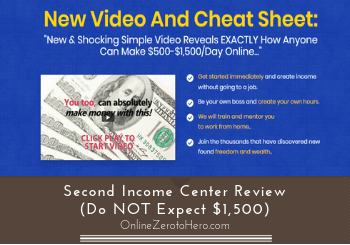 They will also claim that they have a free “cheat sheet and video” on how you can earn $500 – $1,500 per day online. On their video, you will see a news clip about work from home jobs and how it is helping a lot of people worldwide to earn a decent income online. But if you look closely, it’s just a generic news clip about working from home, and it got nothing to do with their program. In my opinion, it’s just a marketing tactic to gain your trust and lure you closer to their program. Based on my research, I found out that their program promotes link posting, which is considered as an unethical method of promoting affiliate links. If you’re still new to affiliate marketing, that in itself is a legit way of making money online, where you will earn money by promoting other people’s product or service. You’ll need to apply to the company’s site who own the product you want to promote to become their bonafide affiliate marketer, and once accepted you’ll be assigned an affiliate link that you will use on your affiliate site or various social media platforms. If people buy a product from the company you are promoting, and they got to their site using your affiliate link, then you will earn commissions in return. However, with the Second Income Center, they are using link posting as the primary method of promoting the affiliate products, which in my opinion, is NOT a good way of doing affiliate marketing. If you’ve visited SIC’s sales page, you’ll see a lot of hype on their landing page and this, for me, already raises some red flags. That’s why I did in-depth research to uncover several red flags on their site, and this will definitely provide you the information you need so you can decide for yourself if this program is for you or not. Here are some of the red flags that you definitely need to know about. 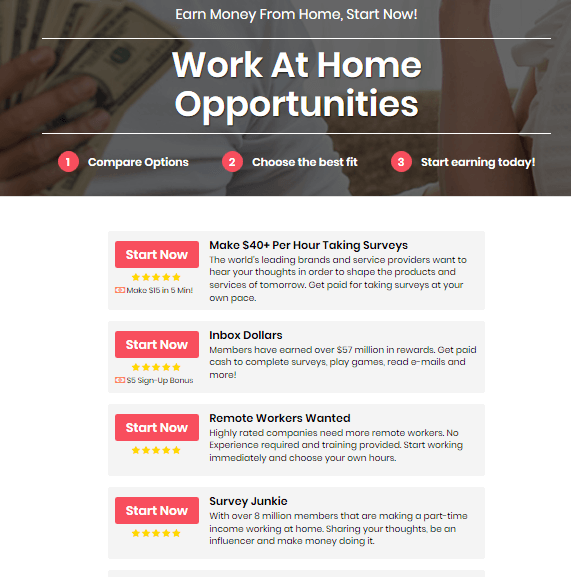 Once you are on their site, you’ll see several claims that you can easily make $500 to $,1500 per day, and many people will find this opportunity exciting, especially if they see the “earn from home” claims on their sales page. But in reality, they are promoting link posting as the primary marketing method in their program. This method involves spamming the URL or affiliate link on various sites, comments section, community forums and on social media platforms. This method is considered as spamming, and it could get your account banned, and you will be forced to create fake accounts to continue with your link posting activities. You’ll need to understand that modern sites today have put in place several measures that can identify and stop spam messages and link. Therefore, even if you spend several hours per day posting links, you will NOT be able to make money, because your link will not go live. The security measure used by these sites is called ghosting or hiding spam links, which means your posts will be invisible to anyone. There are times that your links may go live on other platforms, but you can be sure that its conversion rate will be low. So, the claims on their sales page that you can easily earn up to $1,500 per day using link posting, in my opinion, will only be just a distant dream. In fact, I get people trying this method every day here on OnlineZeroToHero.com as people try to post their affiliate links in the comment section or on my YouTube comment section. I have a filter that stops this, and they never go live. I even sometimes block the IP address of the person doing it. I am a big fan of affiliate marketing, and it is how I make a full-time income online myself. But it needs to be done properly and by providing quality – not by spamming links everywhere. It will not in most cases NOT work, and you will at the same time end up annoying A LOT of website owners and get banned from more and more places. I hope you take this red flag seriously before you decide to join their program. The most significant red flag I discovered about this program is that it’s not exactly a system on its own, but it exists to promote another program called Personal Computer Success. Second Income Center is an affiliate of Personal Computer program. After you sign-up, you will be redirected to another page where you will see the real cost of this so-called program, and you need to pay $97 to access Personal Computer. I also did some research, and I found out that Personal Computer is a long-running program that uses “link posting” as their business model. They have been operating for several years now, and they are using a lot of names. In my opinion, they are not transparent enough to reveal this on their sales page, because they are giving you the impression that they are a separate program on their own, but in reality, they are NOT. Also, link posting is, in my opinion, not a legitimate business model, since it uses spamming methods to promote affiliate links. That is why you need to take this into consideration before you decide to purchase this program. From my research, I found out that the so-called FREE cheat sheet that they will provide you is actually just a page with links to various money-making programs and survey sites. 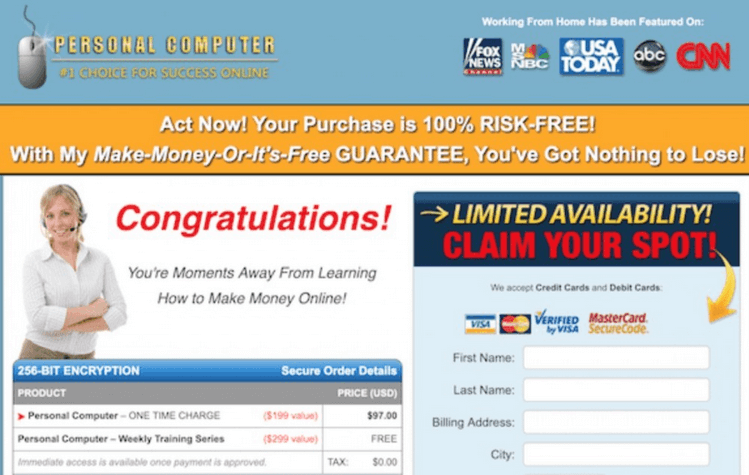 Their cheat sheet contains various links to other make money programs and survey sites. In my opinion, this is not a cheat sheet that could move your affiliate marketing career to the next level, because it doesn’t provide any valuable information that can help you in any way. Also, if you look closely at the links on their cheat sheet page, it’s actually an affiliate link so I can safely say that Second Income center is affiliated with these programs. Therefore, the creator of SIC will earn commissions when people sign-up or purchase these programs. Again, this is another example of them NOT being transparent to us, because they have not revealed this on their cheat sheet page.